Ebert: "[W]hat is it about? It is about personal style. About living life as a kind of artwork." New Yorker, 1934: "The whole thing is fun, though perhaps not for the touchy." I saw this last weekend after being vaguely aware for years that it was A Classic and seeing "ASTA" in about a thousand crossword puzzles. It's hilarious, of course. I've been watching a lot of Archer lately and I feel like that character owes everything to Nick Charles - constantly drinking, completely detached, surprisingly competent, blithely confident that everything will turn out great. The actual murder mystery is completely impenetrable. Who did it? I don't even remember, except that rather disappointingly it wasn't the tidy oddball with the giant book. Are the sequels any good? I've watched the film a hundred times and always forget. It's the squirrely business manager, as I recall. Love the family of eccentrics at the center of this movie. Cesar Romero is fantastic as the gigolo boyfriend. He has only one trick, which is to get quietly upset every single time someone points out he is a deadbeat, but my god is he good at it. They're basically more of the same - fairly forgettable plots that are just vehicles to watch Nick and Nora be snarky and drink a lot. Watching Nick and Nora be snarky and drink a lot is highly entertaining though. AMC or TCM or one of those classic movie channels usually does a marathon of them on New Year's Eve and they're the perfect background-for-a-party movies, because they're stylish and fun and funny but not riveting. Pretty much the epitome of diminishing returns, particularly after the first sequel. Jimmy Stewart is very young and very good in the first sequel. After the baby is born and Nick starts calling Nora "mother" I tune out. "Is he working on a new case?" "Yes, a case of Scotch. Pitch in and help him." Yeah, the sequels are not as great but that does not stop me from watching them whenever they are on. The business manager killed the dad and then tried to cover it up by burying the body in fat man size clothes. However Nick figures it out because the Dad had some embedded shrapnel in his leg. 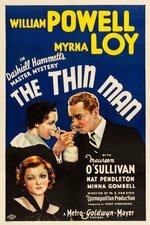 That's why it's called "The Thin Man"; it hinges on the fact that the Dad was thin so they didn't think the body in fat clothes could be his. I only know this because I've seen it like 100 times. The first 50 times I had no clue what was going on by the end. But I blame myself. I think they were purposely complicated and engaging. My favorite thing about these movies is Nora and how she's allowed to be independently just as funny, intelligent, and drunk as her husband. I personally think the sequels are just fine! You know, "fine" in the old sense. On an "Old Movie Club" episode of the Incomparable Podcast, #253, they discuss "The Thin Man" and "The Maltese Falcon." It is agreed that the plots are a little wobbly, but the dialogue shoves aside those minor stylistic quibbles. If you've seen either of the movies, I promise that you will enjoy this podcast. And I agree, bleep: Nora is fantastic! My high school friends & I watched these movies in mixed company and we loved the fact that Nora is entirely her husband's equal -- it's obviously why they're such a perfect pair. This is my counterpoint to arguments that the leads in a TV show should never hook up. This is a prime example of how to do it right. I love the fact that Nick is trying to get a way from his old life and just live it up, but keeps getting pulled back in. Usually by his wife. After the baby is born and Nick starts calling Nora "mother" I tune out. Yeah, pretty much this. Before the baby, though, they're worth watching. The first two are definitely the best of the lot. I read where you were shot five times in the tabloids. It's not true. He didn't come anywhere near my tabloids. One of the few DVD box sets I own is these films. Sharing them with both my first and my current wife has always been a joy. These two are my role models. Would-be Intimidating Cop: Haven't you heard of the Solomon Act? Nora: Oh that's OK, officer, we're married. Unfairly ignored IMHO is another Powell/Loy vehicle, Love Crazy. Nora Charles: All right. Will you bring me five more Martinis, Leo? Line them right up here. That she is. She's the best. I bought the first four movies in a box set the other day, after I mentioned "Nick and Nora" to my beau, and was met with confusion, as he had not heard of them. This was something to be rectified immediately! I love, love, love Nick and Nora's relationship. The banter, the chemistry, the fact that they are both interesting characters who make no excuses. Asta was played by Skippy who was also in The Awful Truth, Bringing Up Baby, and Topper Takes a Trip. I caught that one on TMC, loved it. (I set up a wish-list for my tivo to auto-record anything with Loy + Powell.) I Love You Again was another fun one.